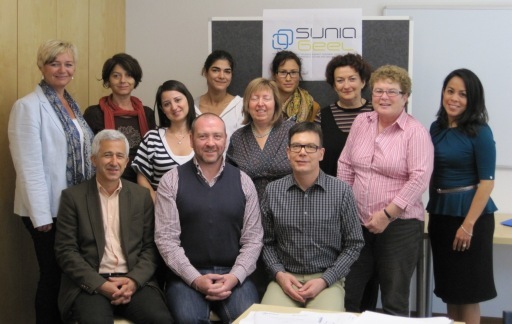 September 2012 saw the fourth transnational partner meeting of the Sunia Geel Domestic Violence Project. Verein Multikulturell kindly hosted the meeting in the beautiful city of Innsbruck, Austria; facilitating a comfortable and conducive environment for working on the project. All five partners were excited to meet again and discuss the development of the project in their home countries. The meeting proved to be a great success. Everyone was delighted, and impressed, to hear the amazing work that each partner is doing in preventing and combating domestic violence against children, young people and women in the different partner countries. Indeed, the Sunia Geel project has worked with over 200 women, 400 families and 89 children. Exchange House alone has provided 62 group counselling sessions in Dochas Prison, in Dublin. The Sunia Geel project is progressing beyond expectations, with various interest organisations, within partner countries, finding the materials, training, seminars and tools produced by the project extremely useful in their work in preventing and combating domestic violence. All partners are enthused about the Sunia Geel project and anticipate the results to be utilised well beyond the life of the project itself.